Beyond history learning, we experienced so much of the culture through the people we met, the places we visited, and as a result of meticulous planning or spontaneous occurrences. I want to share some of these experiences with you in this essay. 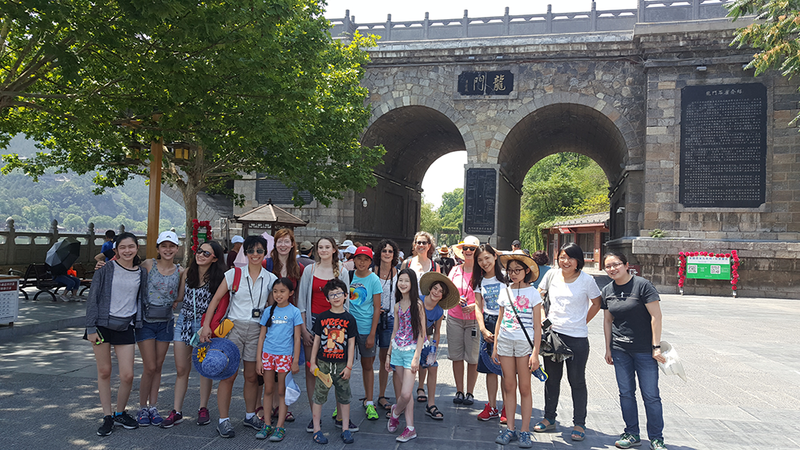 Our group at the Dragon Gate in Luoyang, China. In 2011, I traveled with a group of families through the northeastern region of China all the way to the China-Russia border. While passing prairies, forests and lakes, I felt that something was missing: we didn’t know a single local from any of these areas that we were visiting. I remember looking at the little houses in villages we passed by and wanting to go into someone’s house to see how life was like. Since then, for trips to China, our program made sure that we had contacts with locals there to interact with and guide us. This year, we broadcasted our travel details in various circles of friends and colleagues in China. At the end, we had a group of them joining us most of the way, part of the way or meeting us in their local cities. This year, there was my sister, Xiangyang, who accompanied us from the beginning to the end. She was responsible for getting us the dozens of train tickets we needed throughout the trip. All I needed to do was to tell her a rough travel time and she grabbed the ones with the best time and prices. Amongst other things, she stayed behind at the hotel to accompany a child who got sick; she tracked down a missing suite case of mine that was left on the train; whatever we needed, she was there to offer. There was also Jessie and Lucia, two young women in their 20’s and Fuye, a veteran high school teacher. Jessie works in a health organization in Chongqing and spent her only few days of annual vacation time to be with us. Lucia is a graduate student in language education from Wuhan and she snuck away during her final exam time. Fuye, a former student of my parents, traveled with us for most part of the trip, with his wife and daughter joining us towards the end. Then, we also had Yao Laoshi and Jenny, two teachers who joined us in Nanjing from Zunyi. They accompanied our children to approach and interview the locals and served as translators for our parents, as well as accompanying our families when we needed to break into smaller groups and disperse into the cities. They taught our children how to purchase subway tickets by themselves and grasped each opportune moment to explain anything that stroke interest with them along the way. Fuye and his family with our group at the Presidential Palace in Nanjing, China. Jessie and Lucia looks on while a student is interviewing a doorman at a hotel. 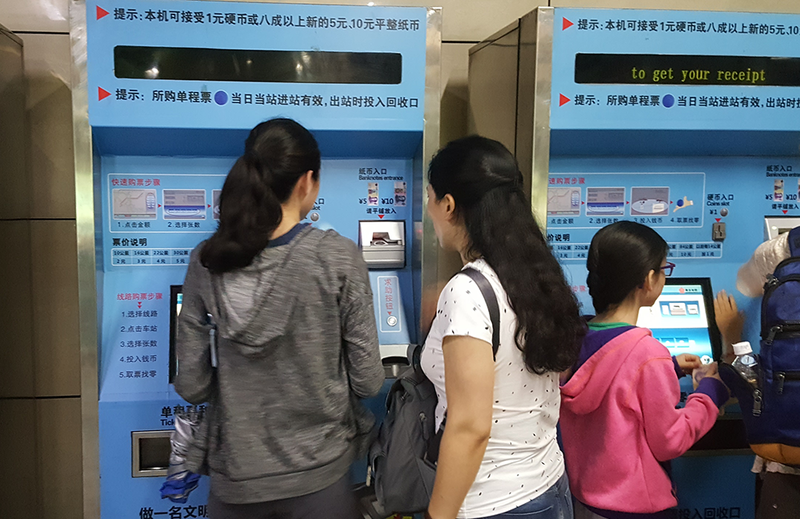 Yao Laoshi showing our students how to purchase subway tickets. Yu Laoshi explaining to our children how the Shanghai subway map works. 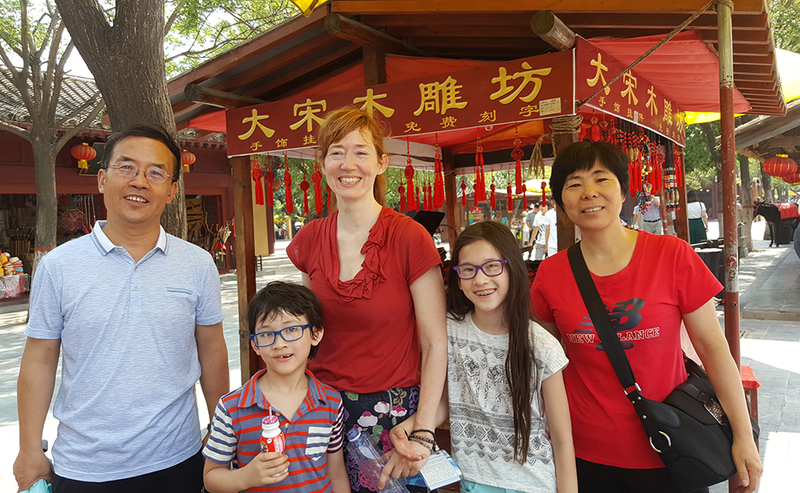 When we arrived in Keifeng, we found Mr. and Mrs. Li (parents of one of our teachers, Nancy) and their two young friends waiting for us. They drove two hours from a nearby town where they live. By the time we arrived, they had already visited our hotel, identified a piece of flat area in the hotel yard where he later performed for us. Basked in the beautiful sunset, we watched Mr. Li and his young friend demonstrate to us the use of several Chinese weapons and magic tricks with cards and coins. 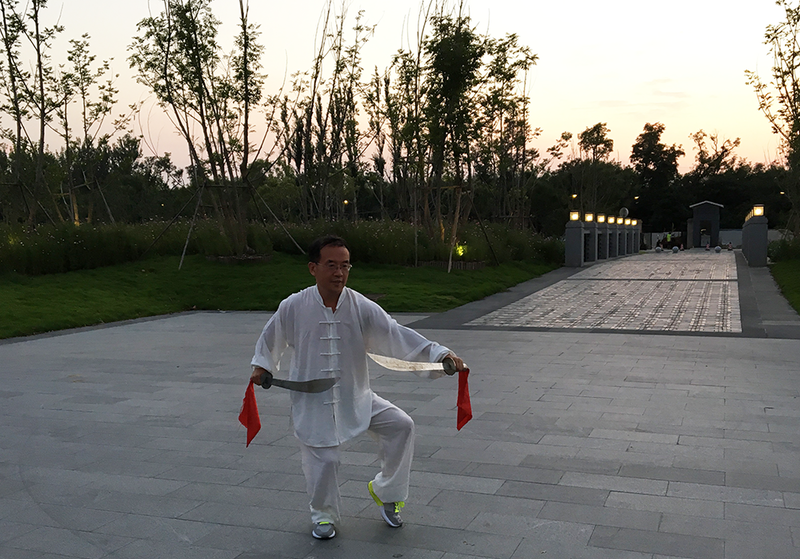 Mr. Li demonstrating martial arts in Kaifeng, China. Mr. Li's friend showing the children magic tricks with cards. Mr. and Mrs. Li with one of our family. To continue our count, there was Yamin, our local guide in Nanjing who loves his city and its history. Two months before the trip, he had already planned and emailed me a 3-day itinerary for us, and had no problem updating the plan many times based on our needs. Timing is crucial when traveling with children to attend events in an unfamiliar city. So, the night before our visit to an island in the city, Yamin walked the route we were going to take the next day. “It would take 20 minutes if you walk non-stop; 30 minutes if you stop on the way. I think the children would want to stop on the way because there are interesting things to look at. So, time the route as a 40-minutes walk,” he reported back to us. These details helped us to have a relaxing and rewarding visit to the island. There were A-Mei and Xiaowen, two locals from Hangzhou. Like Yamin, they also updated their plans many times according to how our children responded to things. 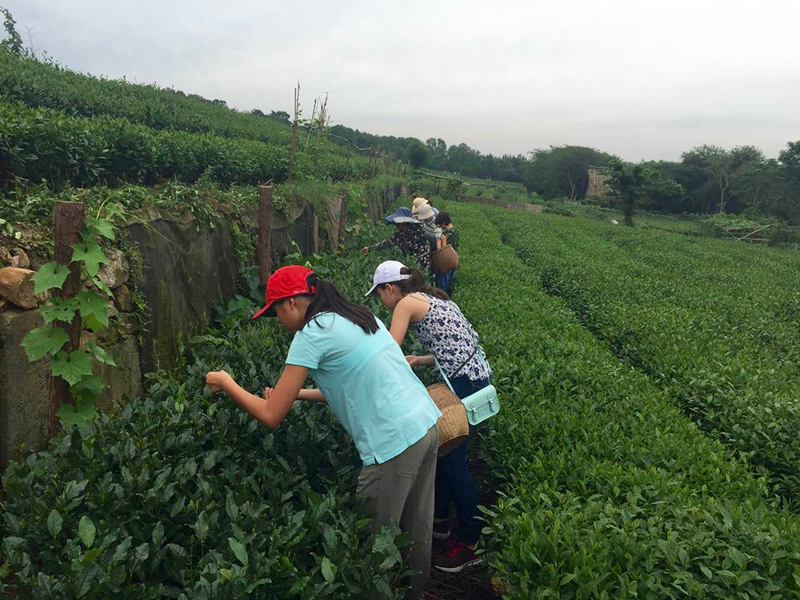 This “live itinerary” led us to adventures such as visiting a tea farm owned by A-Mei’s aunt and Xiaowen identifying Bao Shi Shan as the mountain that was the most suitable for our children to hike. 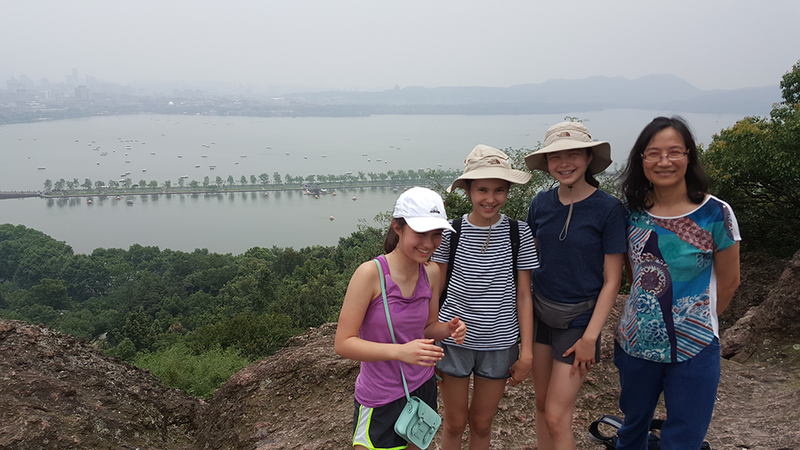 Xiaowen and our students at the top of Bao Shi Shan overlooking China's famous West Lake. Finally, there were my friends, Mr. and Mrs. Wang, the owners of a factory in Hefei. In order to show our children what “Made In China” really meant, this couple opened their factory doors to us. Not only did we get a rare glimpse of the manufacturing process of refrigerators and the community life of the workers, we also enjoyed a fancy Western style meal prepared by chefs from a local Sheraton hotel hired to cook on the spot for us that day. The whole lot joined us to support our program as their main intention. However, by the end of the trip, they felt have gained so much admiration for our American parents and children. Independent, resourceful, interesting and loving are among the top words they used to describe our group. Seeing our children swarm to pat dogs, observe worms, and rescue an injured bird, one Chinese friend commented, “Anything with life seems to attract these children!” I couldn’t have been more proud of our group upon hearing such comments. Now let’s turn to our children. Our students rescuing an injured bird. Downtown Hangzhou: In the drizzling rain, we had just finished strolling Hefang street (河坊街), an ancient street full of boutique shops. Neo’s mother, Yaelle, and I spotted a little restaurant we could have supper at. In front and inside the restaurant, there were big pots of local delicacies being simmered, fried, boiled and baked. Amongst them was a big simmering pot of Chou Dou Fu (臭豆腐) — stinky tofu. Our local Chinese guide, Xiaowen, looked concerned because she saw our children walking into the restaurant holding their noses. She promptly brought up the fact that a famous restaurant called Zhi Wei Guan (知味观) was right around the corner. I almost walked out until I saw Yaelle’s determined look to just stay. As if by coincidence, Neo said, “My nose has gotten used to it. I don’t smell it any more.” At that moment, the other children let their hands off their noses and we sat down at a table. We didn’t order stinky tofu but we got a bunch of other things, including a dish called Jiao Hua Ji (叫化鸡) — Beggar’s Chicken. As was typical of any trip, I grabbed this chance to tell children another story — the origin of Beggar’s Chicken. As the story goes, a hungry beggar caught a chicken, wrapped it up in thick mud and roasted the mud ball in the fire. Once cooked, upon cracking open the mud ball, he found an amazingly delicious chicken. Before our Beggar’s Chicken arrived at the table, a waiter unwrapped the chicken from a piece of paper, and behold was a whole chicken with its head and claws intact. The waiter offered to remove the chicken head, which I agreed, but he added that the claws were hard to cut off because they were tucked inside the chicken before it was roasted. Immersed in the pungent smell of stinky tofu and staring at the chicken claws, the children together devoured two Beggar’s Chickens. Having previously accompanied troops of children (on field trips in NYC and China) that fled from restaurants with the smell of stinky tofu, this meal in Hangzhou was the most satisfying one I have ever had in terms of cultural learning. Our waiter in Hangzou handling the Begggar's Chicken with care. Having some fun with the chicken claw at the end of the meal. Going to the restroom can turn into a real challenge while traveling in China. Soon after our trip started, the children found out that most of the public restrooms are squat toilets. Soon the slang “a hole” emerged amongst the group as a codename for such toilets. When we stopped for bathroom breaks on our way or at restaurants, one of the children would first scout out the bathroom situation and report back to the group. If the report comes back as “a hole,” most of the children would rather hold it until the next bathroom break. When the children asks on the way somewhere, “How long does it take to get there?” They were most likely not inquiring about the distance, but instead trying to estimate when the next bathroom break will be and calculate if holding it in is possible. When we got back to our seats, I told the rest of the children that this child used the squatting toilet and promptly said, “This is what I call being bicultural! It is being comfortable using both your regular toilets and the squat toilets. 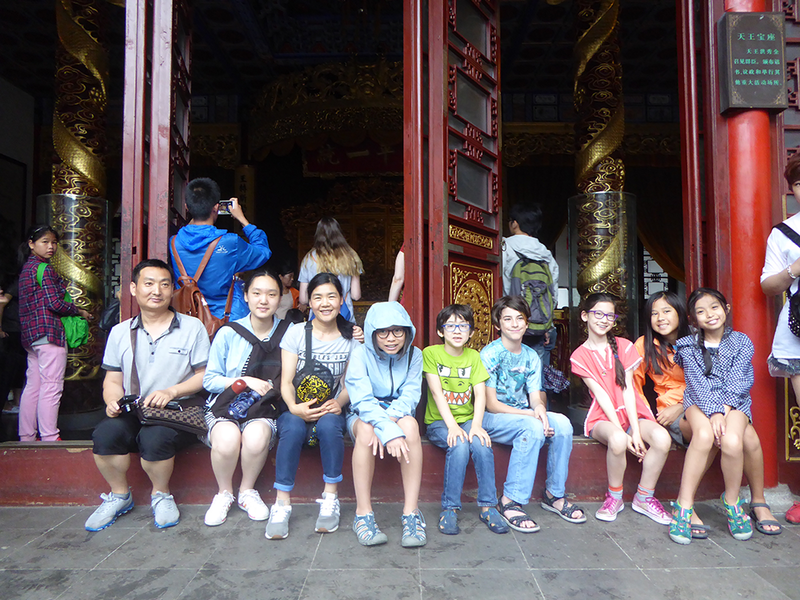 Just like being bilingual, that you are able to speak both English and Chinese, and you can switch easily.” Afterwards, more of the children used the squat toilet with increased frequency. While in Nanjing, one of our children, Amy, got sick with vomiting as one of the symptoms. We decided to take her to a doctor. My top choice of a medical facility in China is the “International SOS.” There are only three branches and one of them, to our luck, happens to be in Nanjing. Amy got sick on the morning when the group activity was visiting Zong Tong Fu (总统府), the Presidential Palace. I passed on the trip and brought Amy to the clinic instead. Two other group members, Marty and Dualta, volunteered to accompany us. Marty is my friend’s son, a 10th grader from China who has been studying in NYC. Dualta is Marty’s classmate from NYC who also joined us for Nanjing. Dualta elaborated that he wants to become a physician and would love to see how doctors work in China. The four of us took a cab and arrived at the clinic. Receiving us were Chinese nurses and a Dr. Jurgen from Germany. After various testing, Dr. Jurgen gave a diagnosis of stomach flu and prescribed two kinds of medicine for Amy. He explained, with great details of exactly how, when and in what quantities Amy should be taking the medicine and with what food and fluids. The information was so abundant that I rushed to take notes. Then, I saw Marty pointing to his cell phone, showing me that he was recording the conversation with the doctor. Dualta also pointed to his cell phone showing me that he too was typing notes. What a sense of support I felt! I was very grateful that after the clinic visit, I was able to confer with Marty and Dualta several times to verify various details while taking care of Amy. Dr. Jurgen at Nanjing's International SOS medical facility. To cut down the cost of hotels, among the six hotels we stayed in various cities, we chose to stay in a new budget chain hotel called A’Tour (亚朵) in Luoyang and Hangzhou. The price was about $70USD per night with a free breakfast voucher for two. More importantly, the hotel has managed to receive close top-notch ratings from Chinese clients that are known to be very picky by the hotel business. We immediately experienced this Chinese style hospitality the moment we arrived. At the check-in counter, which has an open view of a Zen style library right next to it, each of us immediately received a cup of tea or Suan Mei Tang (酸梅汤) — a refreshing beverage brewed from preserved plums that is tangy and appetizing — handed over by a young staff member with elegance. Among the many things they were willing to do for their customers, one staff member even offered to go out and help buy Yaelle a camera card after her own fruitless search prior to this stop. This hotel chain seems to have only catered to mainland Chinese clients up until this point, which means there are still a couple of inconveniences for foreign travelers who do not speak Chinese. At the A’Tour Luoyang branch, the parents in our group found out that they couldn’t pay with their “foreign credit cards” (境外信用卡) and had to dig up their cash instead. A couple of our rooms smelled somewhat like cigarettes even though they were supposed to be non-smoking rooms. At the A’Tour Hangzhou branch, none of the “newly formed staff” were able to speak English. One parent told me with disappointment, “They speak no word of English,” as we stood at the front desk awaiting to check-in. However, the truth be told, our whole group survived this hotel and some (including myself) really enjoyed it. At the lobby of A'Tour Hotel in Hangzhou, China. On the morning of July 3rd, our last day at the A’Tour in Hangzhou, I walked into the dining room with my free breakfast coupon. I found myself inside a breakfast buffet of freshly steamed buns, various types of rice congee, eggs, toast, salad, fruits, noodles and so on. But what attracted me more was the roomful of breakfast crowd — young Chinese men and women on this Monday morning in Hanghzou finishing off their breakfast and ready to leap into their businesses in the city. Then along came our student, Neo, into the buffet. He told me in Chinese that the dining room didn’t have 黄油 (huáng yóu — butter). I was a little confused at first until I over heard a Chinese person from the next table over mumbling to her friend, “他们要吃黄油!” (They want to eat butter!) It seemed like Neo was responding to what he heard. Then, Yaelle (Neo’s mother), asked Neo to look for salt. Neo asked me how to say “salt” in Chinese and went off to ask for salt. I must say I’m very proud of him. The same day, we took a 1-hour high-speed train from Hangzhou to Shanghai for our last night in China at a hotel called Yu Garden. It is located in downtown Shanghai, close to everything. The moment we walked out of our taxi, I felt like we were back in the States. Non-Chinese people with various skin and hair colors roamed around us and diluted in this crowd were the handful of Chinese-looking individuals. 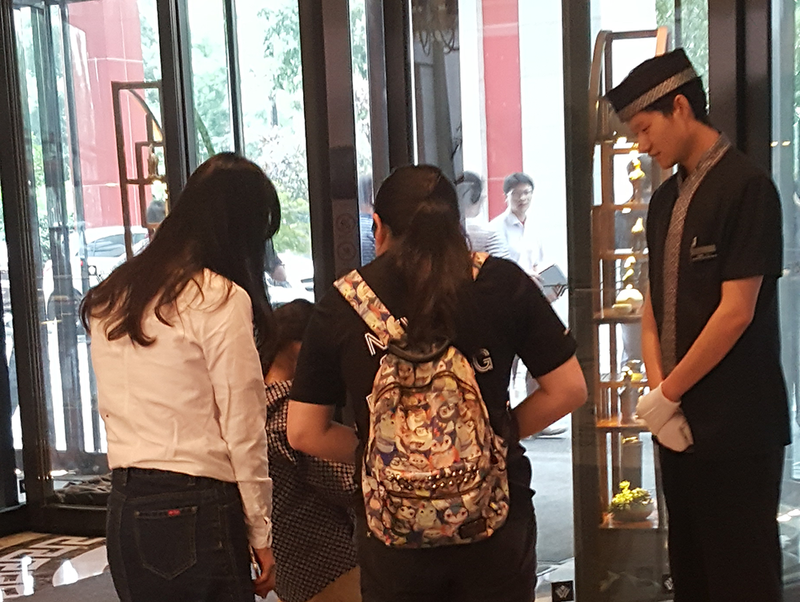 These Wai Guo Ren (外国人 — foreigners) walked in and out of the hotel on their way to or from the Shanghai Bund, completely immersed and comfortable here like they were just strolling in their own neighborhoods (back in whichever country they are visiting from). All clerks at this hotel spoke good English. I sat at the lobby, watching the bellboy, who just pushed our luggage upstairs, dealing with all sorts of people with great comfort and fluent English. In comparison with A'Tour, I’m sure that here at Yu Garden they would have butter for Wai Guo Ren to use on their breakfast toast! A subtle feeling of being out of place swelled inside of me. It was at that moment when I realized how much of a full-Chinese environment we had been in for the past two weeks —whether it be hotels, places we visited, trains we traveled on or subways we were in — that it made returning to a more westernized city feel strange. The more comfort we give up during travels, the more we could experience and learn. It is a straightforward truth that is also easy to forget when you deal with the many hassles of traveling. Interestingly, our group not only didn't mind giving up a bit of comfort, but also went with the flow quite nicely. At a brief bus stop on our way from Nanjing to Hefei, I found myself strolling into a local store with Karen (one of our parents). Karen said she wanted to score some new snacks she had never tried before and I joined her in the hunt. This store had every product imaginable! Except, every label was in Chinese. I thought to myself, this must be what it will be like if I were doing the same thing in a country that uses a language unknown to me. 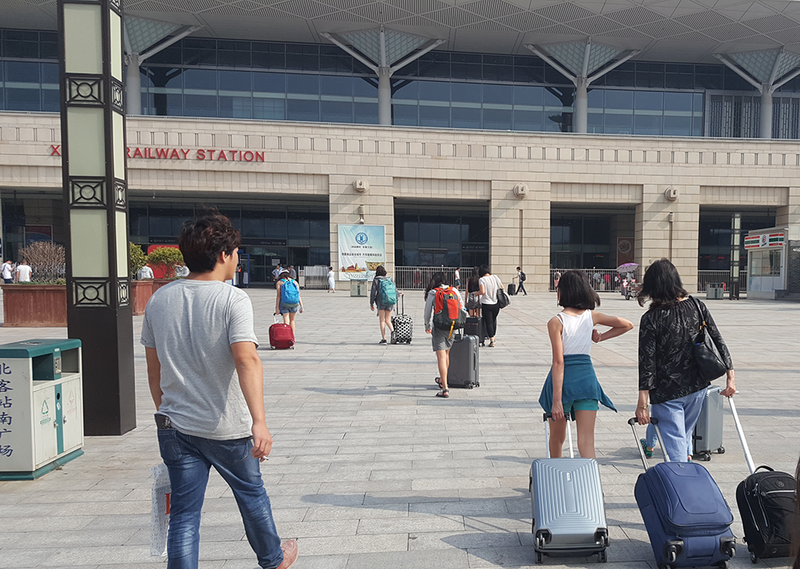 At Hefei train station, we were racing with the departure time of the train we wanted. While waiting in line to purchase our tickets, we had to forcefully brush away several people who tried to cut in front of us. The need of this type of physical contact with a stranger brought back old memories when I was “truly” a Chinese living in China. In Hangzhou, having found shelter from the rain, we settled down inside a coffee/tea house facing the West Lake. The topic of the US presidential election came up. Our local guide, Xiaowen, and a few of got into an intense exchange of views of the US presidential election. We came to see the different lens Chinese and Americans may take over this issue. Each nation, in many ways, is an organic entity. It has a unique pulse that emits its own sense of vitality and that is what creates cultural elements. Some of my Chinese-American friends are rather uninterested in China. What I have discovered is that the elements of China that I know and enjoy are somehow not accessible to them. Thus, I’m always eager to share with people the China I know so that they too can sense its pulse. On a late June morning in Nanjing, we walked along Xu Wu lake (宣武湖) from our hotel to one of the four little islands on the lake — Ying Zhou Island (樱洲岛). Sitting on this island is the Ying Zhou Book Garden (樱洲书房). Our group at the Ying Zhou Book Garden in Nanjing, China. Tea ceremony demonstration at the Ying Zhou Book Garden in Nanjing, China. Flower arrangement demonstration at the Ying Zhou Book Garden in Nanjing, China. For many years (still the case for many students), students in China from elementary school to high school learn the Chinese subject in a way equivalent to English Language Arts in the US — mostly from textbooks. The textbooks are about 100 pages per semester, with a total of 200 pages of text for reading per academic year. That reflected a bizarre and awkward discrepancy between what is a rich Chinese literature tradition and what is served to the children. On one hand, Chinese people have a rich literary tradition, but on the other hand, many children are not offered easy access to it. Organizations have emerged in China in an effort to combat this discrepancy issue. These organizations create great reading materials, train teachers to use these materials in schools, coach parents use to them at home, and also establish community reading outreach hubs. Xu Dongmei is one of the influential leaders in this movement. Her organization, Qin Jin Mu Yu (亲近母语), does all the above. Ms. Xu is a woman of petite stature with a determined look. Her organization has an annual conference that attracts a crowd of over 3,000 Chinese teachers from all over China. The sheer scale of this conference is very telling of how big of an influence her organization has nationwide. Ying Zhou Book Garden (樱洲书房) is only one of the many places where Ms. Xu’s organization reaches out to the communities. This Book Garden is a compound with several rooms, each serving the purpose of reading and other cultural activities for children of all different ages. After school and on the weekends, children from preschool to high school come here and find books to read and attend cultural activities. The south of the Yangtze River is beseeming for picking lotus seedpods in abundance, how exuberantly the lotus foliage thrives with luxuriance. A shoal of fish sport in their midst. Sometimes, the fish swim lithely on their east, sometimes, the fish swim sprightly on their west, at times, the fish swim on their south back and forth, occasionally, the fish swim to and fro on their north. During a brief moment when Ms. Xu and I caught each other’s attention, we got into a deep discussion of how Yinsong (吟诵) was a critical part of Chinese people’s literacy tradition. In ancient China, in order to relate to a literary piece one must yin (吟—to chant) and song (诵—recite) that piece. While she started to demonstrate some lines and chanting a melody that sounded like a blend between reading and singing, I knew another window had just opened for my students to learn and explore something new. 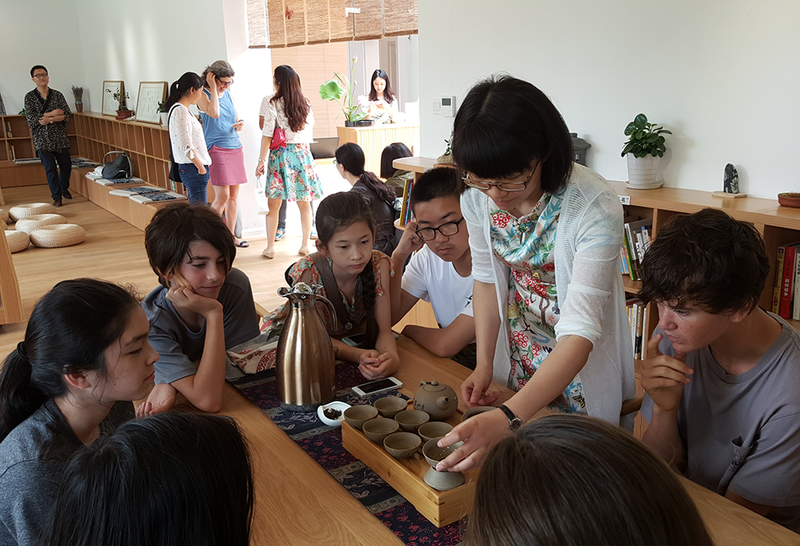 After the Yinsong session, we were treated to a demonstration of flower arrangement - Cha Hua (插花) and tea ceremony. The composure and serenity of the teachers demonstrating these reminded us of the ultimate goal of Chinese people doing these things. That is, to relate to what nature has given us, such as the sounds of the language, the subtly flavored tea leaves and the appealing view of flowers. For me, this very “zen” feeling was especially amplified because it was the first time in my life that I had experienced all three (yinsong, Cha Hua and Tea) together. From Nanjing, we took a 3-hour bus ride to get to Hefei to visit the Zungui Refrigerator Company (尊贵电器) — owned by the family of a friend. 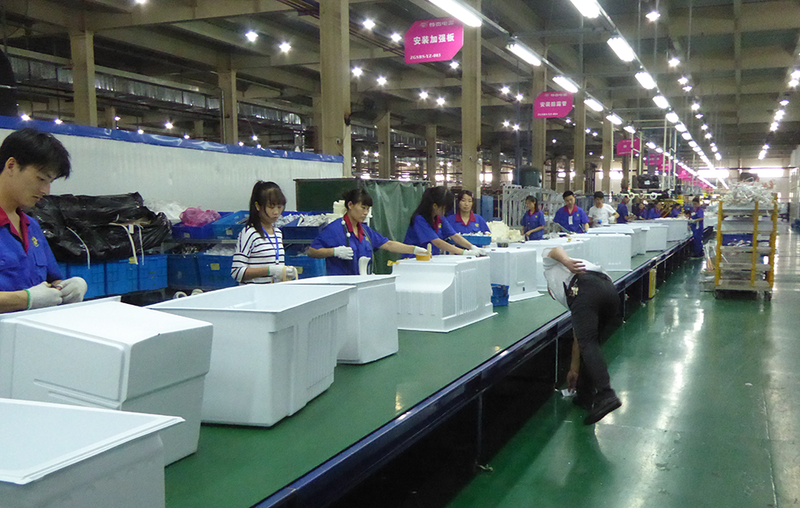 Assembly line inside the workshop at the Zungui Refrigerator Factory in Hefei, China. Q: Does your company have a special design department? If so, how do they do their design, by hands or on computers? A: Yes, we do. We do our designs on computers. Q: Do you have labs to test your products? A: Yes, we have multiple labs to test our products. Q: What is the proportion of products that you sell internationally and to which countries? A: About 40% and to the southeast Asian countries. Q: What is done to properly handle the discarded old refrigerators? A: A national guideline for recyling machine parts has been set up for manufacturers to follow. Our factory is one of the national experimental sites. Workers' dormitory inside the compound of the Zungui Refrigerator Factory in Hefei, China. Later on, inside their spacious and modern workshop, we witnessed how a refrigerator was built — from scratch to when it was packed up and trucked to the warehouse. Q: What do workers do after work? A: They do whatever they want to do, such as playing basketball at the company basketball court. Although the factory provides two free meals a day, some may go out to eat instead, and as a result, many little food shops have opened up around the factory. Q: What is the minimum age of the workers? A: The national standard is 16, but for our factory it is 18. Q: Are there benefits and accommodations for female workers when they become pregnant? A: Their work assignments are changed to better fit their conditions. They have 183 days of maternity leave. I have also heard that the company is considering future steps to develop business that is green. One of the younger members of the family, an 11th grader who has been studying in the US, precisely plans on studying environmental protection in college. It is exactly this type of things I unexpectedly hear or learn about from individuals of humble backgrounds that make me feel the pulse of a country. Wouldn’t you agree? 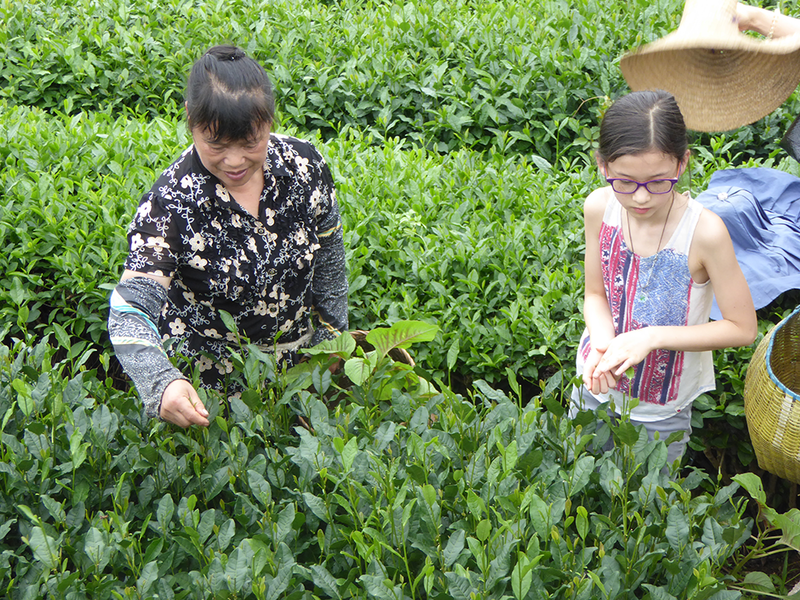 In Hangzhou, we were able to visit a real working tea farm that was far different from the ones that gets put up for shows. From our downtown hotel, it was only a 15-minutes taxi ride until we arrived at Mao Jia Bu (茅家埠), a village full of tea farmers. My friend, A-Mei, led us to her aunt’s home where juicy watermelons and fresh local grapes were already waiting for us on a table in the yard surrounded by grape wines. 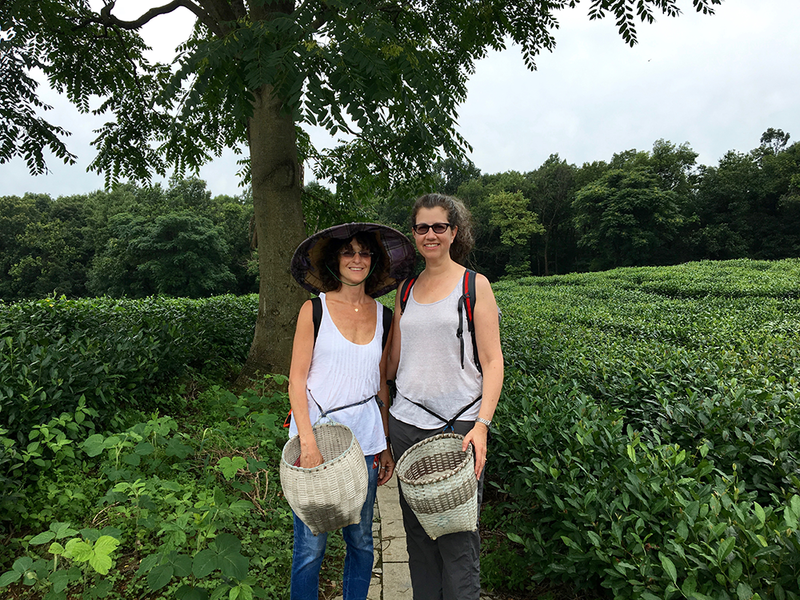 We then changed into our long pants, put on mosquito repellant, put on "team farmer" hats and baskets, and walked into the tea plantation. While a few adults and I walked up and down the hills of the tea mountain and being mesmerized by the views, the children immediately plunged into the activity of picking the leaves. Q: Do you use pesticides on the tea trees? A: Yes, about a couple of times a year. Q: How much tea do you produce annually? A: 1 mu (1 acre = 6.07 mu) of tea can produce 21 jin (also known as catty. 1 jin = 1.10 lbs = 0.5 kg). We have about 0.4 mu in our family, so we make about 10 jin of tea. Q: Can you pick tea leaves any time of the year? A: No. The best time is between March 20th to April 15th. During this busiest time of the year, A-Mei’s aunt needed to hire about 3 to 4 people (meals and logging are provided for the workers). The day-shift workers pick tea leaves from 5am in the morning to 6pm in the afternoon, while the night-shift workers “chao” (roast) the tea throughout the night. This tealeaf preparation procedure includes putting the leaves in a big wok and fumbling through the leaves with their hands (with knitted gloves). A major reason for the harvest rush is that the price of tea goes down exponentially during this time (supply and demand logic), therefore, they have to produce faster to make up for the lost revenue due to the price drop. In addition to producing tea, tea farmers here have also expanded their business, one of which is to serve meals like a restaurant. We had an amazing lunch at A-Mei’s aunt’s home that included a large table full of local delicacies at the price of about $8USD per person. A-Mei said that her cousin (her aunt’s son) enjoys cooking since from a young age and now happily works as the cook for this family business. Jenny, Yao Laoshi, Fuye, Lucia and Jessie, Mr. and Mrs. Li, Yamei and Xiaowen; the dogs, worms and birds we met along the way; the many train and subway stations; the Yingzhou Book Garden, the Zungui Refrigerator Factory, and the Mao Jia Bu Team Farms. There are many more people to meet and places to discover, for many more years to come. Our group before boarding the high-speed rails at the Xi'An train station, China. Moving through the Xi'An train station in China.